When two small words are joined together, the new word is called a compound word. Use the printable worksheets and activities below to help you teach students about this phonics skill. 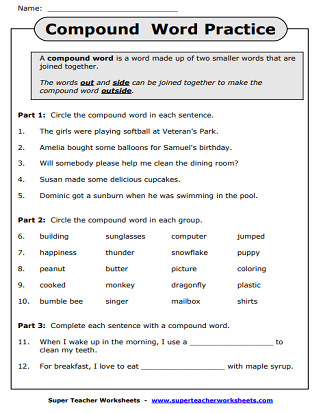 Find the compound word in each sentence and break it up into the two smaller words. Combine the pictures to make a compound word. For example, a picture of a house and a picture of a boat make the word houseboat. 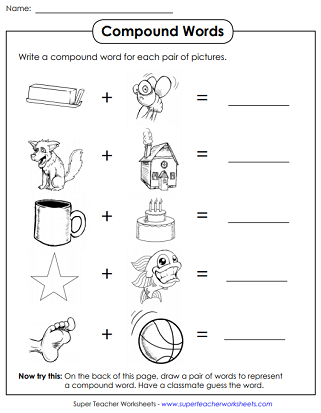 On each line, students must combine two noun pictures to make a compound word. For example, students are given a picture of butter and a picture of a flying bug. They write butterfly. Combine graphics to make compound words. For example, a picture of a cow and a picture of a boy make the compound word cowboy. 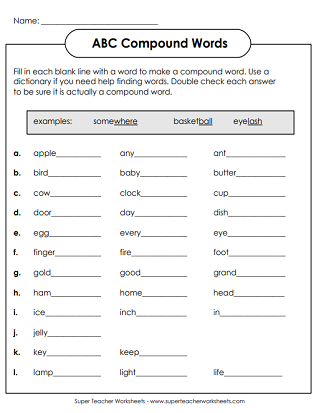 Brainstorm a list of compound words that begin with each letter of the alphabet. Match up the word parts to make a new word. Hands-on cutting, sorting, and gluing activity. Choose the two parts that go together to complete each word. Give a definition of the newly created word. This printable has 3 parts. Part 1: Circle the compound word. Part 2: Which word is compound? Part 3: Think up a compound word to complete each sentence. Draw lines to make compound word combinations. Can you find all of the CWs hidden in the puzzle? Words include chalkboard, candlestick, toothpaste, and more. Try to unscramble these compound words. Words include wheelchair, newscast, everybody, and more. Here's a full list of all reading and writing worksheet sections of this site.